Can one person really make a difference? Absolutely – and Michele Helsel is proof positive. A St. Louis metropolitan area resident, Michele works for Kimball Office, a company that helped sponsor an online campaign to raise greater awareness for childhood hunger in America. One in six U.S. children worries about when his/her next meal will take place. A record 30 million Americans depend on food stamps, and food banks are facing unprecedented need for assistance. These kinds of statistics inspired Indianapolis-based MediaSauce to launch the Pledge to End Hunger, a national, collaborative online initiative leveraging the power of social media to help in the fight against hunger. Visitors to the website www.pledgetoendhunger.com sign a pledge to end hunger by committing to give, volunteer, or share a message with others. Pledge to End Hunger uses powerful social media tools to create awareness, generate conversation and motivate people to participate through popular social networks such as Twitter, Facebook, and MySpace. MediaSauce teamed up with sponsors, Kimball Office, Kompolt, and Share Our Strength to engage their social networks for support. So far, the campaign has assembled almost 5,000 individuals who vowed to make a difference for the more than 12 million children going hungry. Additionally, more than 2,600 people have joined the group’s Facebook cause and more than $28,000 in individual and matching donations from over 700 people has been raised to help Share Our Strength. A friendly competition was held online between state communities to see who could collect the most pledges. The top three states earned a truckload of protein from Tyson Foods benefitting selected food banks. Since her parents have volunteered for years at O.A.S.I.S. food pantry in St. Charles, Michele devoted herself to calling and e-mailing everyone she knew to sign an online pledge that triggered food donations to food banks. 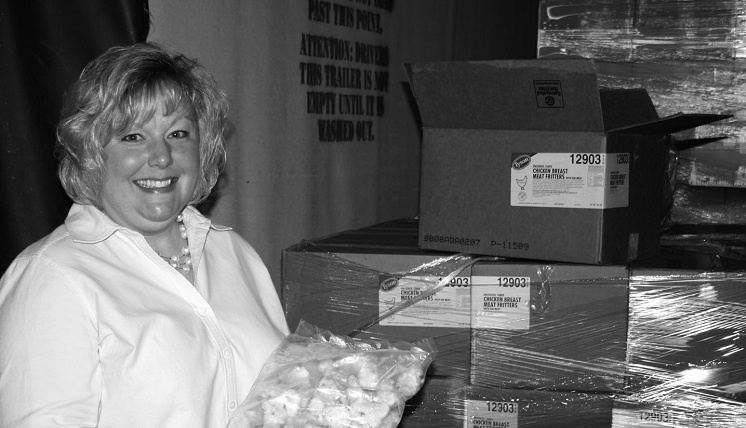 Because of the support of more than 500 Missourians, Tyson Foods delivered 15 tons of protein to the St. Louis Area Foodbank as part of their commitment to Pledge to End Hunger. That’s enough to provide 140,000 servings of protein to area residents in need. Sharon – What shocking statistics on hunger – I didn’t realize….I totally agree that one person can make a difference, and applaud you for highlighting her valuable contributions to ending hunger. It happens one step at a time, and raising awareness for these frontline volunteers is a valuable PR piece. Thanks for sharing Michele’s story.